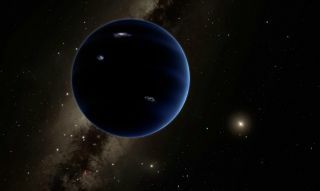 Artist's illustration of Planet Nine, a hypothesized world about 10 times more massive than Earth that may orbit in the far outer solar system. Doomsayers’ fears about the putative planet are unfounded, experts stress. A massive ice giant may be traveling through the outer solar system. Dubbed "Planet Nine," the hypothetical world was proposed to exist after scientists noticed that a handful of objects beyond Pluto had been shaken up in unusual orbits. Search parties have formed to find the unseen planet, with optimistic hopes of spotting it within a year. "It's not crazy; this is the kind of stuff people are finding all the time," co-discoverer Mike Brown, at the California Institute of Technology, told Space.com earlier this year. Brown and lead author Konstantin Batygin, also at CalTech, published a paper in January 2016 suggesting that a massive planet could be stirring up the icy bodies of the Kuiper Belt, a ring of material at the edge of the solar system. Pluto makes its home at the edge of the Kuiper Belt, a region of ice-covered rocks left over from the formation of the solar system. Batygin and Brown noticed that several of the objects had similarities in their orbits, which suggested they were affected by a massive body. The usual suspects would be the solar system’s giant planets, but the objects the pair spotted were too far away to be affected by the behemoths. Not everyone is convinced that an enormous giant is skulking around the edges of the solar system. Ann-Marie Madigan, a postdoctoral researcher at the University of California Berkeley, found that the objects could "self-organize," pushing and pulling one another into their unusual orbits. Working with co-author Michael McCourt of the Harvard-Smithsonian Center for Astrophysics (CfA) in Cambridge, Massachusetts, the pair found that if the objects in the scattered disk roughly equal the mass of Earth, they could have dragged themselves to their current orbits within about 600 million years of the solar system’s birth, omitting the need for Planet Nine’s interference. According to Batygin and Brown, however, the Planet Nine scenario is more probable, because current surveys suggest there isn’t enough mass in the region. In their research, they note that the disk of material that birthed the planets may have started out with enough mass, but interactions with the giant planets would have quickly tossed it out of the solar system. Another study suggested that Planet Nine could be tugging on NASA’s Cassini probe, orbiting Saturn. Agnès Fienga at the Côte d'Azur Observatory in France and her colleagues added Planet Nine to a theoretical model to see if the proposed world could solve the mystery of tiny changes in the spacecraft’s orbit that existing solar system objects cannot account for. If the missing planet lies about 600 AUs away toward the constellation Cetus, the puzzling perturbations can be accounted for. According to Cassini’s mission managers, however, the spacecraft isn’t actually experiencing any mysterious anomalies. "Although we'd love it if Cassini could help detect a new planet in the solar system, we do not see any perturbations in our orbit that we cannot explain with our current models," said Earl Maize, Cassini project manager at JPL, in a statement. Other objects in the Kuiper Belt may help nail down the case for the world. Research by Renu Halhotra, Kathryn Volk and Xianyu Wang, all at the University of Arizona, reveal half a dozen ice-cover rocks whose orbits appear to fit with the presence of a distant planet. "It’s a different line of evidence than Mike Brown and Konstantin Batygin proposed," Volk told Space.com. "I think it’s really intriguing." A planet in the outer solar system today has to come from somewhere. Without directly seeing it, scientists can only model possibilities for the massive world. One possibility is that the sun somehow managed to gravitationally grab onto a free-floating world or a planet orbiting another star and add it to the solar system’s crown. Computer simulations performed by Gongjie Li and Fred Adams, both of the CfA, suggest that the odds of this happening are less than 2 percent. If Planet Nine didn’t come from outside the solar system, then it must have come from within. Models performed by Scott Kenyon of the CfA and Benjamin Bromely of the University of Utah suggest there’s a good chance the hypothetical world could have been born where it was, or been booted into the outer solar system by interactions with the giant planets. "The nice thing about these scenarios is that they’re observationally testable," Kenyon said in a statement. "A scattered gas giant will look like a cold Neptune, while a planet that formed in place will resemble a giant Pluto with no gas." Not everyone is waiting to see the planet before trying to dive inside of it. Astrophysics professor Christoph Mordasini and his doctoral student Esther Linder, both of the University of Bern in Switzerland, modeled what astronomers might see when they spot Planet Nine. Assuming that it is a smaller version of the ice giants Uranus and Neptune, with hydrogen and helium dominating its atmosphere, the pair calculated that a 10-Earth-mass Planet Nine would be about 3.7 times wider than our planet. Temperatures would average minus 375 degrees Fahrenheit (minus 226 degrees Celsius). "This means that the planet’s emission is dominated by the cooling of its core," Linder said in a statement. Sunlight would contribute very little to the light of the planet, making it brighter in the infrared wavelengths than in visible light. Although the world remains unseen, that doesn’t mean we should fear it. Reports by the New York Post published in April claimed that Planet Nine could hurl asteroids and comets toward Earth, with potentially devastating consequences. The video, which had several factual errors, was dismissed by Brown. "Hey, so … fun fact? Planet Nine is not going to cause the Earth's destruction. If you read that it will, you have discovered idiotic writing!" Brown said via his Twitter account, @plutokiller. He also dismissed the idea that the world played a role in mass extinctions of the past. While the planet orbits a significant distance from the sun, it isn’t quite far enough out to stir up the Oort Cloud, the region of icy comets beyond the Kuiper Belt. With a 10,000-year orbit, it would also constantly bombard the Earth, Brown said. "I suspect it has something like zero effect on us, he told Space.com previously. Planet Nine remains hypothetical; no one has actually seen the world. But that doesn’t mean scientists aren’t searching for it. Batygin and Brown started off by searching through previous skymaps, hunting their unseen world. "We dumpster-dived into the existing observational data to search for Planet Nine," Batygin said." Because we didn’t find it we were able to rule out parts of its orbit." Exoplanet researcher Nicolas Cowan of McGill University in Montreal thinks Planet Nine might show up in present and future surveys of the cosmic microwave background. Depending on the planet’s orbit, it could also be picked up by the Dark Energy Survey, a project in the Southern Hemisphere designed to probe the acceleration of the universe. NASA’s WISE instrument should also be able to spot the giant, helping to narrow down the potential paths of the planet. Linder and Mordasini remain cautious. According to their models, existing surveys would likely be incapable of spotting the world if it weighs in at less than 20 Earth masses, especially if it was far enough away. Batygin and Brown are trying to obtain telescope time on the Subaru Telescope on Mauna Kea in Hawaii. They’re asking for roughly 20 nights of observing, a significant amount of time on a powerful instrument that is constantly in use. "It’s a pretty big request compared to what other people generally get on the telescope," Brown told Space.com. "We’ll see if they bite." If they do, he estimated that the planet could be spotted within a year. The number of new papers about Planet Nine makes it impossible to capture the scope of recent research in a brief article, but here are a sampling of interesting findings being discussed. These mostly relate to Planet Nine's impact on the solar system as a whole. Planet Nine could have tilted the entire solar system, researchers said in October 2016 at a joint meeting of the American Astronomical Society's Division for Planetary Sciences and European Planetary Science Congress in Pasadena, California. The eight solar system planets orbit the sun at a tilt of about 6 degrees compared to the sun's equator. Computer simulations suggest a Planet Nine-sized object could have caused the tilt over the 4.5-billion-year-old lifetime of the solar system. A study presented at an American Astronomical Society meeting in January 2017 suggests that Planet Nine could be a "rogue planet" that strayed into the gravitational field of our sun, and was captured. While the scenario sounds improbable, other studies have shown that rogue planets may be more numerous than "normal worlds" around host stars. In April 2017, citizen scientists picked out four potential objects that will be studied to find out if they can be linked to Planet Nine. The discoveries came from objects mapped by the SkyMapper telescope at Siding Spring Observatory in Australia. Researchers added that even if the search turns up empty, at the least they have ruled out a Neptune-sized planet in about 90 percent of the southern sky, as far as 350 AUs. Separately, there may be yet another large object in the Kuiper Belt, a region of space farther than Neptune that has thousands of icy objects in it. Astronomers said this theoretical body may be disturbing the orbits of Kuiper Belt objects. The orbits of the KBOs that are farthest away from us tilt in a particular way that suggests an object is perturbing their orbits with its gravitational field. Follow Nola Taylor Redd on Twitter @NolaTRedd or Google+. Follow us at @Spacedotcom, Facebook or Google+.